HOUSTON (KTRK) -- A man pulled over on his birthday last week got a big surprise -- an unscheduled trip to the county jail on drug allegations. It happened March 21 when a Montgomery County Pct. 4 officer pulled Jabari Lawson over for a traffic offense. 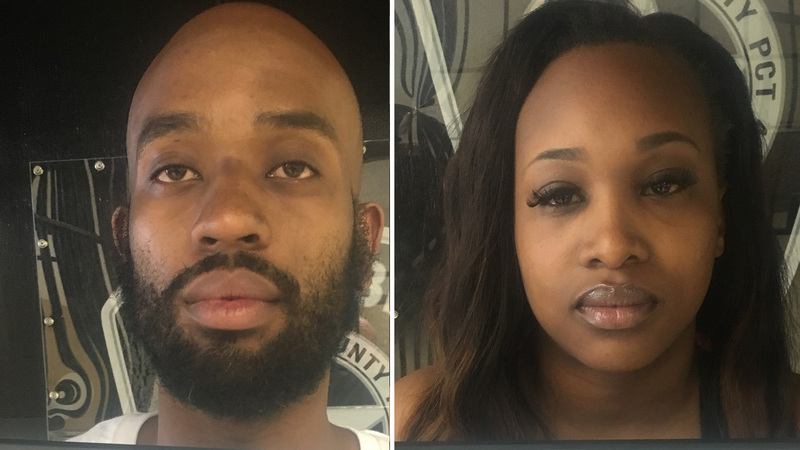 During the stop, the officer allegedly discovered Lawson and his passenger, 27-year-old Schenetra Holman, had a baby bottle filled with codeine. They were also reportedly in possession of marijuana. Lawson, who was celebrating his 28th birthday, was arrested on possession charges, along with Holman. A couple of days later, Montgomery County authorities made another roadside arrest that led to a bizarre booking photo. A deputy stopped Brandon David, of New Caney, after he reportedly ran a stop sign near Loop 494 and Johnson Road. There, an officer determined the 23-year-old allegedly had been drinking and driving. He was arrested on a DWI charge and taken to jail, where authorities took the photograph below. Brandon David, of New Caney, is charged with DWI.